Death of a Six-Foot Teddy Bear by Sharon Dunn gets five stars from this reviewer for two aspects of a genuinely good novel: a solid mystery in the classic tradition, and humorous elements that really are laugh out loud funny. Clues and red herrings are skillfully placed, providing a fun challenge to those genteel readers who enjoy piecing together the puzzle, and I am happy to say that this book does not follow a typical “ACME Mystery Writing Formula” that is easily spotted and used by far too many cozy writers today. Best of all, there really is a six-foot teddy bear in the book! Thus, not long into the story, the genteel reader begins to encounter such delightfully zany sentences as The bear nodded at her, crossed his legs, and picked up a newspaper. The characters are people we would love to spend time with, inside the book and out. The Bargain Hunters Network, as they call themselves, are four genuinely nice ladies with real quirks and endearing traits that may remind you of someone you’ve known in the past, or the kind of friends you have today. There are a couple of smaller storylines on the side, but these do not distract from the mystery at all. Kindra, youngest of the bargain hunting gal pals, has an interesting romance with a fascinating character, and the conclusion of this part of the book provides for some interesting insight into what real love is, or at least what it should be. Spunky senior citizen Arleta does some soul searching and comes to a surprising, but satisfying, conclusion on the direction her life has taken. Ginger, the real heroine of the bargain hunter novels, has many hilarious misadventures, a few heartbreaking ones, and finally discovers that her priorities may need some slight readjustments. These sidelines are brief but enjoyable, and add to the cozy friendship feeling of the novel. Sharon Dunn has written two other novels in the Bargain Hunters Mystery Series, and this reviewer hopes to read many more. Her most recent series is the Ruby Taylor Mystery Series. Six people gather at a swanky 40’s era nightclub to celebrate the birthday of the title character, the beautiful but self-absorbed Rosemary Barton, who gracefully lifts her champagne glass for a birthday toast at midnight and drops dead on the expensive silk tablecloth the very next minute. 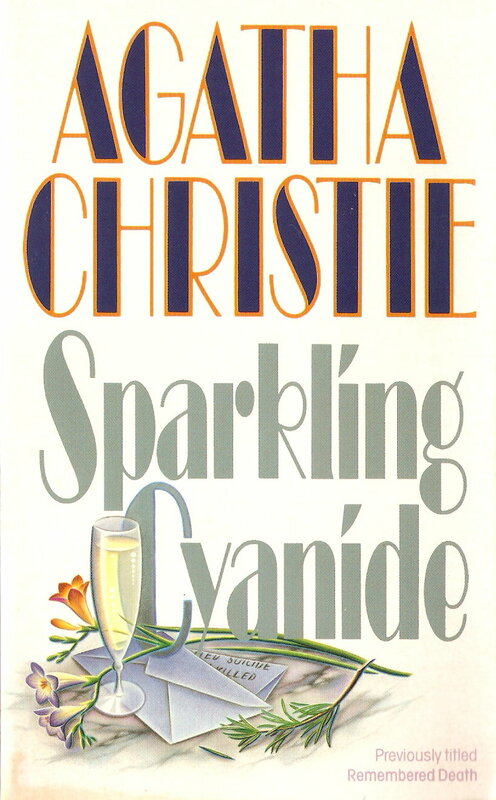 This novel was originally the Hercule Poirot short story Yellow Iris, with similar settings and characters but a completely different ending. Poirot doesn’t appear in the novel. I have a particular fondness for both versions of the story, and the novel is notable in that it presents a different form of storytelling than the typical mystery. In Part One, the six characters who were present when Rosemary died each tell their story of what happened that fateful night and the months preceding it. In this way the genteel reader is given insight into the lives and minds of the suspects and may, perhaps, begin piecing together the jigsaw puzzle toward the eventual conclusion of the mystery. The remaining two parts of the novel revert to the usual straightforward style of a murder mystery, telling us “what happens next” and keeping us turning pages until the satisfactory conclusion is reached, in deft Agatha Christie style. Please visit my Pinterest page, Marvelous Mystery Book Covers, for more mystery-type things!